Sometimes, simple is better. That's what this pasta salad is -- simple. Crunchy asparagus and juicy tomatoes shine brightly with a lemon dill dressing. 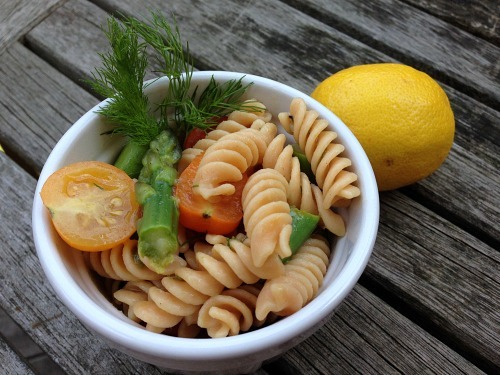 I think it's best to make gluten-free pasta salad the day you want to eat it. If you let it sit in the refrigerator over night, the pasta can get tough. If you do have leftovers, I think it's a good idea to let it come back to room temperature and toss with a little extra dressing to replace some of the moisture that got absorbed by the pasta. The folks at Tolerant Gluten-free Foods sent me some of their single-ingredient pasta to try. It's naturally gluten-free, vegan and allergen-friendly because it's made from either red lentils, green lentils or black beans. I used the Red Lentil Rotini in my salad. I liked the flavor, color and the clean ingredient list -- organic red lentils. That's it. For this salad, you could use any pasta you choose. While pasta is cooking, break off tough ends of asparagus and discard. Slice asparagus into one-inch chunks. 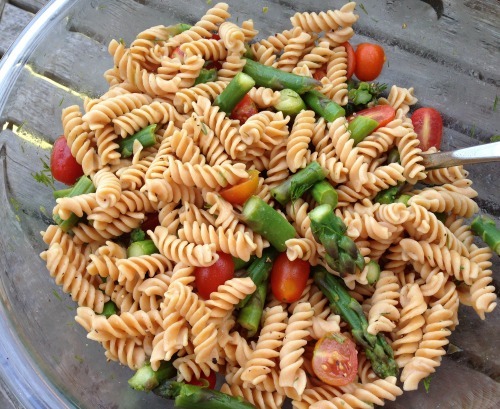 When pasta is done cooking, toss asparagus into pasta pot, then drain pasta and asparagus. Whisk together lemon juice, olive oil, dill, and agave if using. Toss pasta and veggies in dressing. Serve warm or cool down a bit in the refrigerator. FTC Disclosure: Tolerant Gluten-free Foods sent me boxes of pasta to try. All opinions are my own. It seems like simple is almost always better! You've got the flavors spot on with this recipe Kim!